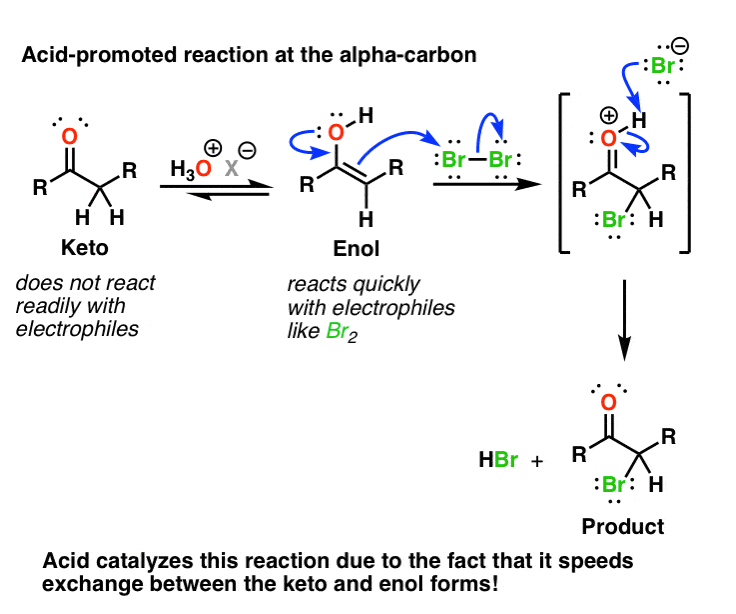 Between posts on tautomerism and on lewis acid catalysis, I neglected to mention a really important point in carbonyl chemistry that illustrates another facet of acid catalysis: Acids catalyze keto-enol interconversion. What am I talking about? Let’s back up for a second. Remember ketones and enols? Ketones: good electrophiles, react with nucleophiles at the carbonyl carbon. Enols are their tautomeric, nucleophilic alter-egos, which react with electrophiles at the alpha carbon. Got it? OK.
Like I mentioned previously, for a plain vanilla ketone like acetone (2-propanone, commonly used as paint thinner) the ratio between keto and enol is about 6600:1 at room temperature. One really interesting observation is that when you dissolve acetone in D2O, you slowly get incorporation of deuterium at the alpha carbon. This is the enol tautomer at work – it reacts with a proton/deuteron source at the alpha carbon and regenerates the ketone. Under normal conditions, this is a pretty slow reaction. But when you add a bit of acid, suddenly the rate of deuterium incorporation drastically increases. What’s going on here? Let’s call the rate for conversion of ketone into enol K1 and the rate for conversion of enol into ketone K2. 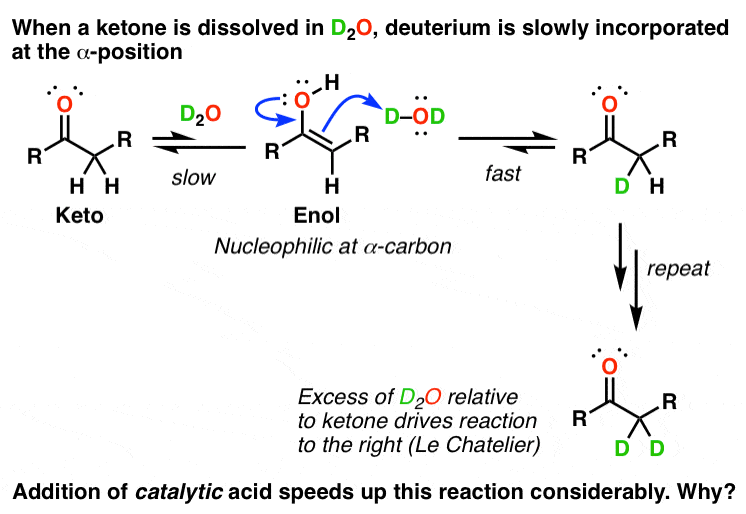 The cool thing is, acid speeds up BOTH reactions for keto-enol tautomerism – both the forward and the reverse reaction. Here’s how it works. 1) For K1 (keto to enol), acid protonates the carbonyl, making the carbonyl carbon more electrophilic. The more electrophilic the carbonyl the stronger an acid it becomes at the alpha carbon (remember, trifluoroacetone is more acidic than acetone). So deprotonation at the alpha carbon becomes much easier in the presence of acid, which results in the enol form. 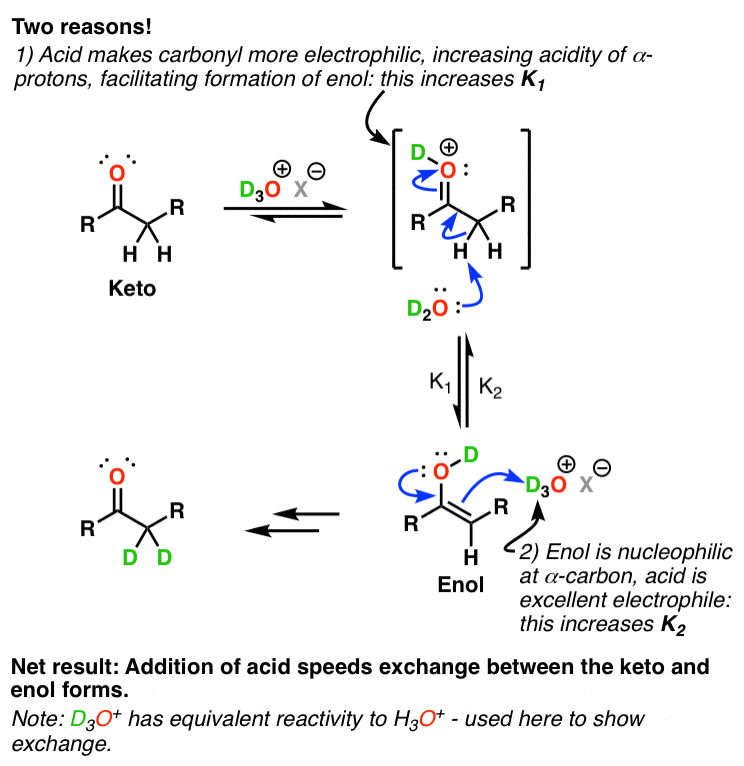 2) For K2, acid also speeds up the conversion of the enol to the keto form. The enol form is nucleophilic at the alpha carbon, and reacts with the strongest electrophile around. An acid – say, D2SO4 – is a much, much stronger electrophile than D2O, so this is going to increase the rate of the enol to ketone conversion. Again, note that acid is acting as a catalyst here. It’s not being consumed, but it’s lowering the barrier between keto and enol interconversion. Why is this important? Well, here comes the really cool part. Acid acts as a catalyst for the incorporation of all kinds of other nucleophiles at the alpha carbon besides protons. For example, this is how acid-catalyzed bromination works. Bromine (a strong electrophile) doesn’t react well with the keto form, but it reacts extremely well with the nucleophilic enol form. So in this reaction, bromine basically lies in wait for the ketone to tautomerize into the enol form, and then POW! it pounces on it like a piranha on exposed human flesh. Through Le Chatelier’s principle, more of the enol form is created from the keto form, and slowly but surely, the ketone is converted to the alpha-bromo ketone. The rate of the reaction is dependent on the rate of formation of the enol, so when acid is present, the reaction is sped up tremendously. This is also how the acid-catalyzed Aldol reaction works. I’ll get into that in my next post.